This year's ACPT was awesome, as usual! 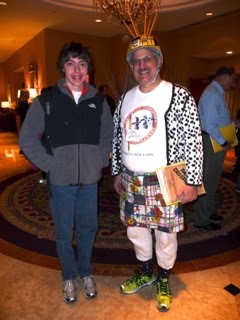 I arrived very late Thursday night and ran into XWord Info's Jeff Chen and litzer Doug Peterson in the lobby. The next morning, I braved the subway with my parents and went to Chelsea Market in Manhattan, where we had scads of sapid comestibles! I was hoping to see Alton Brown of Cutthroat Kitchen (one of my favorite shows! ), since the Food Network is in the same building, but that didn't happen (though I did see a TV crew filming in one of the shops). We got back to the hotel in the early afternoon, and Stan Newman and I had an authentic New York pizza nearby. 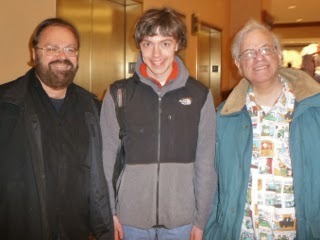 Later that afternoon I got to meet and shake hands with crossword legend Henry Hook! I was also delighted to see an article by Jonathan Kalman about the Pre-Shortzian Puzzle Project appear on the very first day of the ACPT! 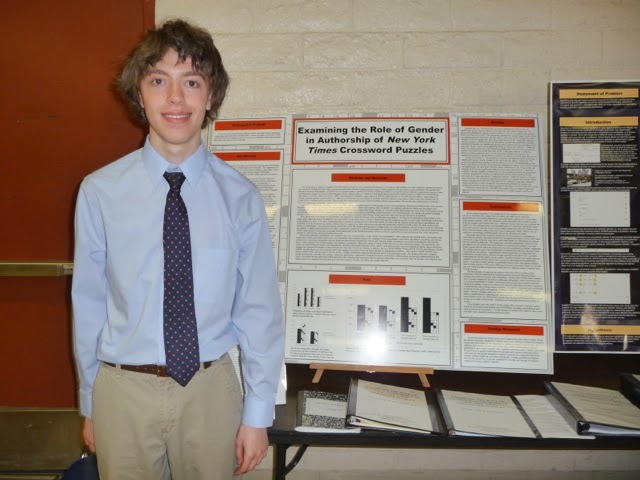 To read his piece, "Teenage Crossword Puzzle Maven Goes Digital," click here. Friday evening, puzzlemaster Will Shortz got the tournament events under way with a very fun Carnival of Puzzles in which attendees solved their choice of any four of ten puzzles created by noted puzzlemakers! I realized too late that there was a strategy in choosing which puzzles to solve (though at least—thanks to my parents' warning!—I managed to avoid humiliating myself on Stan Newman's Digital Trivia Quiz!). I discovered that solving a diagramless for the first time under timed conditions was not one of my better ideas, though I was able to finish Fred Piscop's Split Decisions puzzle and Roy Leban's USA Word Search. Soon everything became a whirlwind of activity! In the post-games reception, I met and reuned with many new and old friends, both in the lobby and in long conversations in the sixth-floor puzzle suite. Over the three-day weekend, I was able to talk with many litzers, including Howard Barkin, Tracy Bennett, Peter Broda, Joe Cabrera, Lynn Feigenbaum, Andrew Feist, Vic Fleming, Mangesh Ghogre, Angela Halsted, Nancy Kavanaugh, Jeffrey Krasnick, Andrew Laurence, Tom Pepper, Doug Peterson, and Brad Wilber (apologies if I've left anyone out). Saturday began with the puzzle market—an entire hallway filled with tables of puzzle books and merchandise—at which I picked up plenty of freebies. I was also thrilled that one of my puzzles appeared in the Times that day—out here in California, I've never actually seen anyone solving one of my puzzles in public, so seeing and talking to hundreds of my solvers was amazing! Later that morning, Will kicked off the actual tournament. I had a blast solving such a twisty, creative octad of crosswords over the weekend! Merl Reagle and Brendan Emmett Quigley gave me a real run for my moola, but I was still able to (mostly) finish everything. And comparing notes with other solvers after finishing each puzzle was great fun. At lunch I shared a delicious plate of chicken skrewers [sic] with Tom Pepper. Later on, I was amazed that I could actually identify a couple of the celebrities in a game of Peter Gordon's Celebrity: Get a Clue app! I've received a lot of positive feedback about this research, and I'm hoping to continue it in the future. Clearly the relatively small proportion of puzzles published by female constructors over more than 70 years is an issue of great importance, especially as the crossword community moves forward. When I returned from the ACPT, I presented my findings at a regional Intel science fair and was also delighted to discover a new feature on XWord Info that I think many people will be interested in: Stats about women constructors! This is a fascinating compilation of data that I'm planning to look into more closely after school gets out. Back to the wrap-up: By late Saturday night, I think many litzers had forgotten about the get-together in the lobby. In fact, I was so busy with other things that I forgot about it myself until someone reminded me. But a few litzers stopped by for two ilks of Oreos, and I had fun joining in on a game of Ghost! I was surprised and honored to win second place in the D division this year, and I'm looking forward to moving up to C in 2015! Congratulations to all the other winners and participants, especially Dan Feyer, Tyler Hinman, and litzer Howard Barkin, who were the top three scorers! 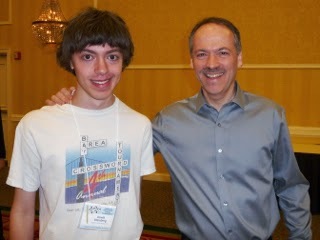 And thanks again to Will Shortz, Helene Hovanec, and all the judges and constructors who make the ACPT such an enjoyable experience every year! I'm already counting the days until Stamford! On to the project! It's been a busy couple of weeks, despite the ACPT. Two weeks ago Friday, Tracy Bennett sent in 31 proofread puzzles in the evening. Saturday morning, Lynn Feigenbaum sent 4 puzzles. That afternoon, Denny Baker sent in 7 more, putting us over 15,400 on the litzing thermometer! And that night, Todd Gross sent 11 more proofread puzzles. Monday morning, Nancy Kavanaugh sent another mega-batch of 42 puzzles, which were followed that afternoon by 4 from Barry Haldiman and 4 more from Denny. Tuesday morning, Lynn sent another 4 puzzles. Wednesday afternoon, Joe Cabrera sent 7 more puzzles, which were followed by 4 from Denny on Thursday afternoon. 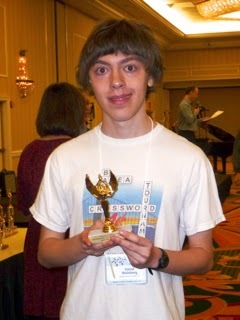 Friday morning Peter Broda sent 6 puzzles, then this week early Monday morning Mark Diehl sent 19. Tuesday morning Barry Haldiman sent 8 more, putting us at 15,500 on the litzing thermometer and his own total at more than 1,400—congratulations, Barry! That afternoon, new litzer Susan O'Brien sent in her first puzzle—welcome aboard, Susan! Wednesday afternoon, Denny sent in 4 more puzzles, which were followed by another 3 from Susan Thursday morning and 9 more from Mark late that night. Early this morning, Todd Gross (who recently celebrated his 50th birthday—happy birthday, Todd!) sent in 10 proofread puzzles. And this week Howard Barkin sent in 14 puzzles too! Awesome job, everyone—thanks so much again! I know it's slower going with the Sunday puzzles now (especially the 23x ones! ), but we'll get there—as I write this, we're already at 15,531! Today's featured pre-Shortzian puzzle, whose constructor is unknown, was originally published August 8, 1964; edited by Margaret Farrar; and litzed by Mark Diehl. This puzzle's theme—greetings and farewells—initially struck me as being rather simple and a bit dull. 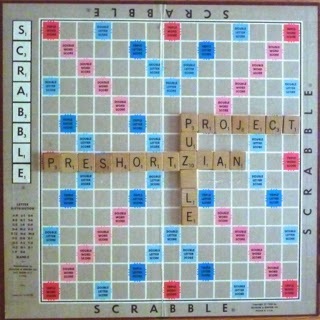 However, when I looked at the puzzle more closely, I discovered that the theme is actually quite elegant: The theme entries are symmetrical and interlocking; each synonym of hello and goodbye is contained in movie, book, or song titles; all the theme entries containing greetings read down, while all the theme entries containing farewells read across; and no synonym of hello or goodbye is repeated. Also, with the slight exception of A FAREWELL TO ARMS, all the greetings and farewells are at the beginnings of their entries. It's very rare to encounter a pre-Shortzian puzzle whose theme is consistent on so many levels, so from a thematic standpoint, this puzzle is way ahead of its time, even though ADIEU TO THE PIANO feels slightly less in the language than the other three theme entries. I also like how the constructor was able to incorporate a smattering of lively eight- and nine-letter entries by lowering the word count to 72—SALT MINES, APIARISTS (cleverly clued as "Men in the honey game. "), HIMALAYAN, DIME STORE (also cleverly clued clued as "Place to buy pans, pens, pins, etc. "), and DAPPLED are particularly strong! On the other hand, the puzzle contains quite a few uncommon pieces of crosswordese, partials, and iffy abbreviations, including TECO ("Mexican native. "), ENARE ("Finnish lake. "), DADE CO ("Site of Miami, Fla."), ALEMS ("Turkish flags. "), MOD SP ("Present-day orthography: Abbr. "), A DIRE ("C'est ___ [that is to say]. "), SOLUS ("Alone on the stage. "), and PIMAN ("Of an Arizonan people."). The entry that intrigued me the most in the nonthematic fill was SPALPEENS ("Irish rascals. "), which has yet to appear in any other puzzle in the Ginsberg clue database. According to Merriam-Webster, we get the word spalpeen from the Irish spailpin, both of which originally referred to a poor migratory Irish farm worker. One Web site speculates that spalpeens had such a low status in Irish society that they became synonymous for rascals or mischief-makers in general. What an interesting word! Anyway, aside from the APIARISTS and DIME STORE gems, the bulk of this puzzle's clues are standard for their time period. I was particularly amused to see HESSE clued as "Part of West Germany.," which is no longer accurate. In all, this is an interesting pre-Shortzian puzzle whose theme is a cut above! The answer grid (with highlighted theme entries) can be seen below. Clue: Feature of modern industry. Clue: Modern aid for buyers. The DIAL TONE clue tickled me the most, as the telephone itself is losing ground to the almighty cellphone with its much catchier assortment of RINGTONES. 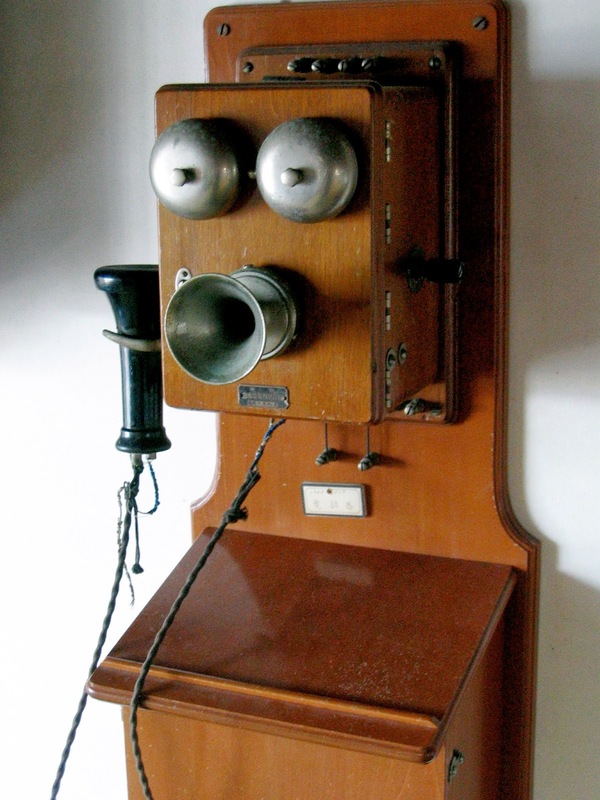 Here's a picture of an early telephone model. The three silver protuberances accurately depict my facial expression upon discovering that people actually used phones like this at one point! Thanks, Tom! I think it would be very interesting to analyze crossword editors' actual submissions data, but I haven't looked into whether that would be feasible yet. Over 15,600, In 1945, and Only 42 Packets Left!